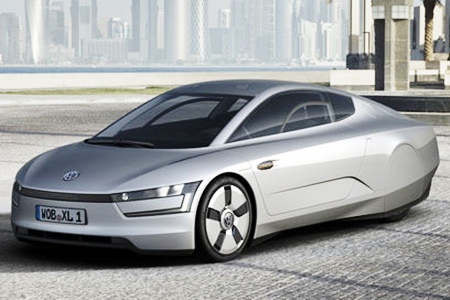 At the Qatar motor show Volkswagen showed the XL1 Super Efficient Vehicle concept following on from the L1 concept in 2009. Side by side two seater, instead of the L1’s passenger behind the driver, the new car has an 800 cc twin-cylinder engine, as opposed to the L1’s 299 cc single-cylinder diesel engine. The new car is more efficient, using 0.75 liters per 100 km where the L1 used 0.99 L/100 km. The XL1’s diesel engine produces 35 kW of power and 120 Nm of torque, while the electric motor generates 20 kW and another 100 Nm of torque. The engine mates to the small plug-in electric motor that can either power the car alone using battery power, or step in to assist the diesel engine when needed. The engine and electric motor provide drive to the rear wheels using a seven-speed dual-clutch gearbox. To show just how economical this VW concept really is, the fuel consumption figure for the Toyota’s Prius hybrid is 3.9 L/100 km, round about four times greater than this new XL1. Over 15,000km of driving, the XL1 will use a little more than 110 liters of fuel. By comparison, the Prius will use more than 580 liters of fuel. The XL1 weighs 795kg, by using a carbon fiber skin and a range of weight-saving technologies that have the potential to make their way into more conventional Volkswagen models. These include the bucket seats, which weigh just 40 kg each, and lightweight ceramic brakes. Plastic panels are also reinforced with carbon fiber. Main metal components contribute 184 kg in weight. Other metal components include magnesium wheels and aluminium components for the shock absorbers, the steering system and brake calipers and the whole drive-train weighs 227 kg. The electric motor and its battery system add another 105 kg. Performance has the 0-100 km/h sprint at 11.9 seconds and the top speed is limited to 160 km/h. According to Volkswagen, the XL1 uses technology that makes it “viable for series production”, suggesting it could go on sale within the next few years. “Although the XL1 is still very much a concept, its unveiling marks the next step towards the birth of a new class of super-efficient vehicles, while the advent of a process such as reinforcing plastics with carbon fiber is a significant milestone,” a VW spokesman said.